What’s the view? Is this seedling – Wow! ? Bah! ? Pretty ? Ugly ? Commercial ? A keeper ? A Discard ? Or shoot the breeder ? Uh, yeah, about that: INTRODUCE IT. Or send the stock to my address! If nothing else, I would cover every pistil with tazetta or jonquil pollen; from its downward stance, this may also lend itself to triandrus breeding. All for more decorative flowers, of course, bringing potentially more more fun into each division. 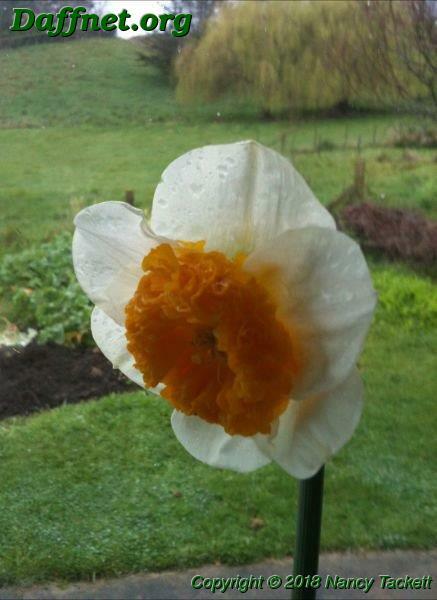 I personally think it’s a beauty in its own right, but everyone knows my opinion about these sorts of flowers! Hope all is well, Brian. Thanks for sharing! and children romping in a garden will want to pick it and take it home. PS> Ben, I like using emoticons, maybe we could have some in the upgrade ? I agree it would show well in the garden. Needs a better perianth for show table. The colours and the form of the corona are impressive. It may be of commercial interest. What are the parents? would use for further selection. He has not smooth petals. They include – Jac. Lefeber, Brodie of Brodie, Guy L. Wilson, Lionel Richardson and mainly Grant E. Mitsch, Dr John Reed & myself. followed owe so much to those who have gone before. Anyone who bothers to read the above will probably find it very boring – but I’ve been interested to be reminded that I have grown all the flowers listed except one – Hillbilly. Maybe try to do sibcrossing? 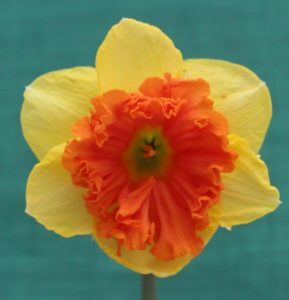 Attached is a photo of Johns seedling 97/97A from (Corofin x Placid) x Can Can Girl, this has a similar double frilled crown to the seedling that Brian Duncan posted to daffnet. Thought you maybe interested. We have collected nearly all the seed from the 40 crosses John made this year. He is finding it hard to do as much as he used to, he gets very tired and has trouble walking. This getting old is no good now we are both in our 80’s. We have had our ground certified for exporting, so will start digging in January. I am in the process of getting a list ready. 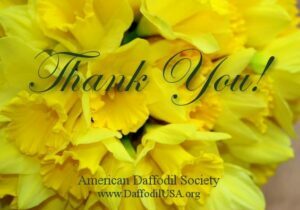 We will send a couple of bulbs for the ADS to auction for their fundraising for daffnet. Check out Modern Art from 1973. These flowers have been around for a long time. Modern Art multiplies like a weed here and sells out very quickly. Hardly. The Modern Arts genotype hardly contains the lycopene gene. 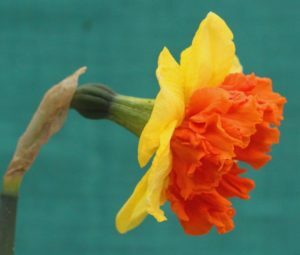 is not peas, daffodils in the vast majority – tetraploids. pink but having half or three quarters of the lycopene gene dose. I was thinking form, not colour.